This case study will examine the environmental destruction from the charcoal industry that has flourished in Somalia’s situation of state collapse and low-level conflict. The Somali political situation, characterized by a lack of central government, the absence of the rule of law, and the prevalence of local militias engaged in commercial activities, has created a situation that has allowed actors in the coal industry to over-exploit forests, leading to deforestation and other environmental degradation. But what makes this industry so profitable (but ultimately unsustainable) is the huge increase in demand from Saudi Arabia and other Gulf States. This combination of external actors and a lack of any national authority or effective regulation make the charcoal industry extremely harmful to the Somalia’s long-term environmental situation. The root cause of the destructive nature of the charcoal trade in Somalia is the lack of rule of law and an effective government with the power, authority, and will to restrict the activities of charcoal traders. This case study will first provide a brief historical overview of the political situation that has given rise to the environment in which traders can profit from the trade in charcoal. Next, this case study will explain the details of how the charcoal industry operates. Finally, the case study will follow the ICE template to describe the relationship between the charcoal industry, low-level conflict, and the environment. In 1991, the two decades of military dictatorship of Siad Barre came to an unceremonious end. With his regime weakened with the end of the bi-polar era and unable to coerce or co-opt his political opponents, the United Somali Congress (USC) ousted Barre from Mogadishu. The USC, led by General Muhammad Farah Aideed, failed to establish a government of national unity and broke apart between rival faction leaders. The years from 1991-1994 were marked by extreme brutality and clan-based violence fueled by decades of clanism and cronyism under the Barre regime. During the mid- to late-1990s, faction leaders gradually lost their power and appeal as regional administrations and other local forms of governance challenged their authority. One such arrangement was the system of Islamic courts that emerged, providing a significant degree of stability and rule of law. A coalition of Islamic courts and local authorities that recently rose to national prominence and power in late 2006 was the Union of Islamic Courts (UIC), until their ouster by Ethiopia in early 2007. In 2000, a peace conference held in Arta, Djibouti and heavily supported by the Arab league produced the Transitional National Government (TNG). This weak and ineffective administration was heavily opposed by many section of Somali society, and failed to establish a functioning government. Another attempt by TNG opponents to form a national government in 2002 resulted in the Transitional Federal Government (TFG), but this arrangement represented even more narrow interests, particularly those of Abdullahi Yusuf, then President of the semi-autonomous administration of Puntland. Failing to establish itself as a legitimate authority, the TFG nearly collapsed into irrelevance with the rise of the UIC in Mogadishu, but Ethiopian support and military intervention has since put the TFG in power in Mogadishu. Currently, the TFG has the support of the international community but is mistrusted by most of the Hawiye clan, the dominant clan in Mogadishu, and faces an insurgence lead by Hawiye clan members and remnants of the hard-line elements of the UIC. Under the rule of General Muhammad Farah Aideed, who exerted control over much of Southern Somalia and Southern Mogadishu from 1992-1997, the charcoal trade was banned because of the serious toll it exacted on the environment. However, the ban on the charcoal trade died with General Aideed in 1996. General Aideed’s son, Hussein Muhammad Aideed, imposed no such restrictions on the trade, allowing traders to over-exploit southern Somalia’s savannahs and dense forests. Local authorities and clan elders attempted to restrict the trade themselves, but this led to violent clashes between clans. Since then, both the TNG and, more recently, the Union of Islamic Courts, have tried to stop the harmful trade, but have met with little success. With President Yusuf of the TFG at the helm of Somalia’s weak interim government, the charcoal industry is unlikely to be reined in, as President Yusuf used taxes on the charcoal industry to help fund his administration in Puntland. His connections with the businessmen and traders not only helped him profit from the charcoal trade, but also to import arms to support his militias despite the UN weapons embargo on Somalia. The reason for these failures is that there is a strong economic incentive for traders to continue to export Somalia’s natural resources. High demand for charcoal in the Gulf States, due to their strict laws on preventing local deforestation, has created opportunities for large profits for traders willing to brave the ports of Kismayo and Mogadishu. At the year 2000, Somali charcoal traders would sell a bag of charcoal to a merchant in Kismayo for around US$3-4. That merchant would then sell that charcoal in one of the Gulf States for around US$10 And the Gulf States have been more than willing to engage in this trade, taking advantage of Somalia’s political situation to gain access to much needed energy sources at a relatively low cost. The high demand for charcoal in Gulf States also coincides with a dearth of other options for many Somalis. With a ban on cattle exports, and other methods of livelihood made unavailable because of the economic and political situation, the lure of an income from the charcoal trade becomes more understandable. Charcoal is made by burning wood in an enclosed area at high temperatures. In Somalia, this is usually done in small space dug out of the earth and enclosed with concrete blocks and brush piled on to seal in the air, or, as is pictured, in a steel drum. This is either done by local Somalis who have no other economic options, or sometimes by local militias with chainsaws. They then sell the charcoal in bags usually weighing about 25kg each to militias to transport to a port by truck or donkey cart. During transportation, loads of charcoal must pay local authorities taxes, as well as roadblock fees, and sometimes taxes on using clan lands. When they reach the city, Somali businessmen connect local militias with merchants operating vessels willing to brave the shady legal environment of the charcoal trade. These merchants buy bags of charcoal for around $3-4 each, but once they reach Saudi Arabia or the UAE, they can sell for around $10 a bag. This huge amount of profit balances the risk of international waters and the expense of transport through Somalia’s often dangerous environs. The effect that this system of economic incentives is having is difficult to measure because of Somalia’s security situation. However, considering the charcoal industry has been behind deforestation in other parts of Africa, one can assume that, with the lack of any oversight or restrictions, the charcoal trade will have a devastating effect on Somalia’s forests. This is also likely to increase the occurrence of desertification in Somalia, depriving pastoralists of grazing land and farmers of cultivatable areas. Income from the charcoal trade also provides important financing for some warlords and faction leaders, enabling them to maintain their strength and continue their predatory regimes. While predatory militias profit from the charcoal industries, it is the more powerful businessmen that are the real power behind the industry. This section of society is powerful enough to hold a veto over any political arrangement that threatens their interests. Thus, any attempts to halt the charcoal industry must court the very businessmen that profit the most from it. Unfortunately, as forests become sparser but demand in the Gulf States continues, or even rises with other fuel costs, intense competition may ensue over controlling the remnants of Somalia’s charcoal industry. There has already been conflict between clans over the charcoal trade, and this will only become more likely as competition intensifies. As deforestation and desertification limit the availability of other natural resources, conflict around these is likely to rise, as well. Somalis who rely on the acacia forests for their livelihood will see their opportunities for supplementing their income decrease, as game dies out, desertification hurts farming, and the eventual destruction of the acacia groves will also end their ability to supplement their income by participating in the charcoal trade. With charcoal supplies shrinking, the cost of fuel for domestic use will also continue to rise, raising the cost of living for Somali families. The situation in the Sudan is an analogous one, where scarce resources exacerbate and create ethnic and racially based narratives of grievances. Prior to 1991- With charcoal exports limited under the Barre regime, charcoal was created only for local use and was much more small scale and sustainable. Although illegal industries have generally flourished since the fall of the Barre regime in 1991, when there was no longer a central government to regulate and control internal industries and exports, the charcoal trade was still restricted in the regions of General Aideed, which included much of the main production areas in the south. Following Aideed’s death in 1996, his son took control of his faction, but failed to continue the charcoal ban. Demand from Gulf States increased and the industry thrived. 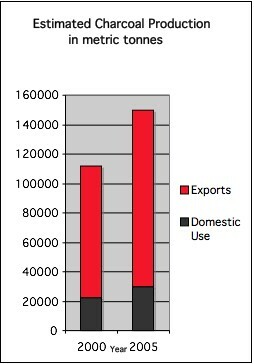 For a short period of time following the creation of the Transitional National Government in 2000, charcoal exports were again banned, but this ban was poorly enforced and ineffective. Many local administrations, especially Islamic Courts that were set up to govern many towns in the south, also banned the trade between 2000 and 2004. Conflict erupted again in 2004 involving clan competitions over the charcoal trade, and since then, though the Transitional Federal Government and the Union of Islamic Courts (UIC) banned the trade, the export of charcoal continues to contribute to deforestation in Somalia, and with the resurgence of conflict following Ethiopia’s attempts at ousting the UIC, it is likely to continue for some years to come, or as long as the acacia groves last. Somalia’s acacia groves are located in the area between the Juba and Shabelle rivers in southern Somalia. This inter-riverine area is where conflict over the charcoal trade has turned violent. 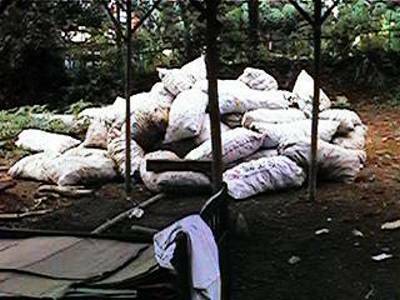 The charcoal is mostly exported out of Kismayo, although much is shipped to Mogadishu for export and domestic use. 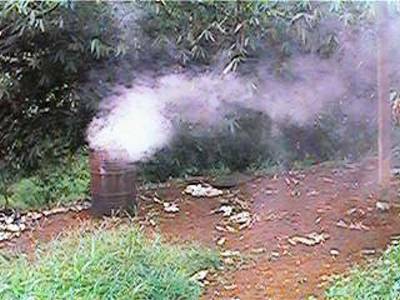 Most charcoal is made between Brava and Kismayo. The source problem in this case is that of deforestation. The charcoal trade in Somalia takes a heavy toll on the acacia forests of southern Somalia, as traders clear-cut entire swaths of forest for shipment to gulf states. The process of turning cut wood into charcoal is also a rough, dirty process that pollutes the air, albeit in a very local fashion. While the impact on the global environment and global warming is negligible at best, the ramifications of the charcoal trade on the local environment and the livelihoods of Somalis are drastic. In the year 2000, total charcoal production was estimated to be 112,000 metric tons and was estimated to rise to 150,000 metric tons by 2005. Approximately 80% of this charcoal is destined for stoves in the Gulf States, while only 20% is for domestic consumption. The loss of ground cover and root systems leads to increased erosion in the riverine areas. This accelerates the process of desertification, decreasing the amount of land useable for agriculture or even grazing, pushing locals out of areas as they become uninhabitable after charcoal traders clear all of the trees. This deforestation also decreases bio-diversity as species that relied on the acacia groves are unable to survive without them. All of this ultimately hurts the livelihoods of Somalis not involved in the charcoal trade in these areas. Pastoralists and agriculturalists rely on the acacia forests to play their part in maintaining the delicate balance that makes life in arid Somalia possible. Pastoralists graze their cattle in the grass that flourishes while the acacia groves’ root systems hold in ground water and prevent erosion. Agriculturalists grow staple crops in neighboring lands, but as erosion increase without the acacia groves holding in top soil, their lands are becoming fallow. With forests destroyed, these groups must move to other areas in order to survive, or engage in the charcoal trade themselves, which only deepens the cycle of destruction. Somalia is a largely arid nation of sparse savanna, with pastoralism still a primary source of income. Agriculture is mostly restricted to the riverine areas of southern Somalia near the Juba and Shabelle rivers. These riverine areas are also home to low density savanna woodlands, mainly consisting of Acacia trees. This forested area covers 52,000, representing only 9% of Somalia’s total land. This limited amount of forest area is rapidly shrinking as the charcoal trade continues. The Somali way of life, relying largely on grazing cattle and camels or subsistence farming, means that changes in the environment can quickly upset the delicate balance required to survive in Somalia. The Gulf States consumption of charcoal affects Somalia because of its unique political situation, it is unable to handle the increased demand for charcoal in an environmentally sound way. This situation has risen because of the confluence of several factors. First, the Gulf States banned the destruction of their local forests in the late 1980s and early 1990s, creating demand for charcoal imports. Additionally, they also banned Somalia’s primary export at the time, cattle. This dealt Somalia’s economy a tough blow, and pushed many into the charcoal trade. 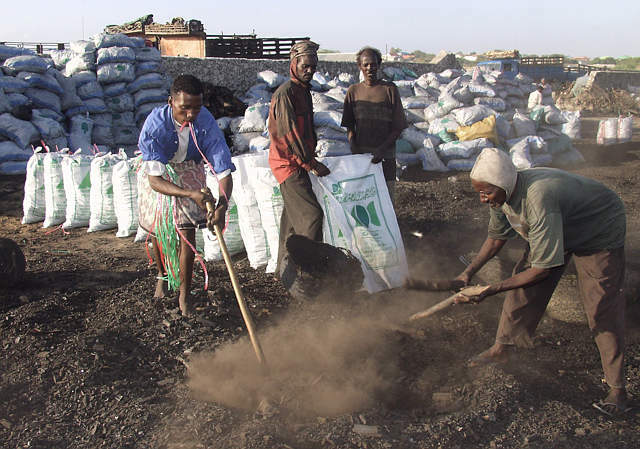 Second, Somali descended into a situation of statelessness where, after 1996, it was possible to export charcoal without concern for the environmental impact. Finally, systems for conducting business without a state have emerged in Somalia that make their role in international commerce possible. While the deforestation occurs in Somalia and Somalis feel the environmental impact exclusively, this situation would not be present without the demand for charcoal from Gulf States. Somalis have relied on charcoal as a source of energy for centuries, but have been able to balance domestic consumption with environmental preservation. This increased demand, combined with the lack of a central authority in southern Somalia, has led to the recent environmental crisis. Though the conflict in Somalia has recently developed significant interstate aspects, with the invasion of Ethiopian forces in support of the TFG, the conflict is essentially a civil war between rivaling factions, albeit with both including external actors to aid them. But, especially as it relates to the conflict around the charcoal industry, it is essentially civil in nature. The Abgal and Habar Gidir clans dominate the charcoal trade. These two large sub-clans of the Hawiye clan are dominant in southern Somalia. Their business connections in Kismayo and Mogadishu help them connect charcoal makers to merchants willing to ship the loads to the Gulf States. This activity has largely been at the expense of the local Tuni clan that inhabits much of the forested area, who resent being left out of the lucrative business. This division, amongst others, has put these two groups at odds with each other as the Tuni have many connections to the Somali Reconciliation and Restoration Council (SRRC), while the Abgal and Habar Gidir supported the TNG during its brief existence from 2002 to 2004. The SRRC was formed as a foil to the TNG, and represented many clans and sections of Somali society that felt threatened or left out of the TNG. More recently, the former SRRC supporters have largely leant their support to the TFG, which has since alienated many Abgal and Habar Gidir clansmen. This has significant ramifications for the charcoal industry, but due to the current conflict, details on recent developments are unavailable. In summary, political rivalries and limited resources have created a clan-based dynamic to the conflict over charcoal. However, while many militias benefit from the charcoal trade, the group benefits most from the production of charcoal in the south is the Juba Valley Alliance (JVA). The JVA is a coalition of leaders that have joined forces to provide a degree of stability in the regions they control. While they use profits from the charcoal trade to fund their militias, these groups also contribute to the overall stability of the area. Thus, to say that the charcoal industry funds armed factions does not necessarily mean that the charcoal industry funds conflict, as the Somali situation necessitates that nearly every significant actor has a heavily armed militia. The conflict surrounding the charcoal is intrastate, with most activity involving Somali actors. While environmental damage is significant, and the level of conflict in Somalia has been high recently, the conflict around the charcoal is more accurately described as low, as violence is intermittent. Some of the violence has been between traditional leaders and their militias clashing with charcoal traders in attempts to prevent them from continuing to exploit their local forests. Traditional conflict resolution methods have prevented this from progressing into further violence. Landmines have also been used in relation to the charcoal trade near the town of Brava between Kismayo and Mogadishu. Minibuses carrying passengers along this main route have been the main victims of these landmines. This is part of a conflict between the local Tuni clan and the Abgal and Habar Gedir clans that dominate the charcoal trade. Less than a dozen landmine related incidents have occurred in that area since 2004, several involving minibuses carrying over a dozen people. The conflict over Somalia’s coal is indirect as it deals with the issue of the increasing scarcity of sources of charcoal. As climate change increase rates of desertification in arid and semi-arid areas like Somalia, and populations grow, they will continue to put pressure on the forested areas in southern Somalia. However, the charcoal industry, obviously, has an even more rapid and devastating effect. 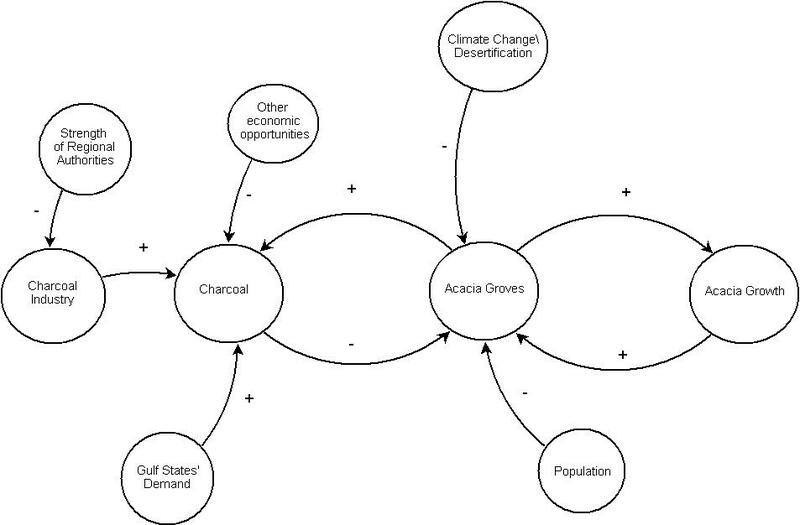 What contributes to how much charcoal is produced is a complex interaction between several factors. First, without the demand from Gulf states, the opportunities for such huge profits would not drive actors in the charcoal industry. Compounding this is the lack of other economic opportunities, making participating in the charcoal industry an even more attractive option. Finally, what has the power to control the charcoal industry are governments and regional authorities that have power and legitimacy. Only an effective ban encompassing all of Somalia’s important ports and charcoal producing areas will be able to counter the destructive short-term logic of exploiting Somalia’s acacia groves for charcoal exports. Although conflict over Somalia’s coal is only occurring in Somalia, the issue is a regional one as the coal is being exported to and consumed by the nearby Gulf states of Saudi Arabia, UAE, and Qatar. However, the most effective methods for limiting the harmful effects of the coal industry would need to enacted in Somalia by regional or municipal administrations. As with any issue involving Somalia, speaking of problems at a national level is misleading, as there is no central government. Somali politics, and Somali problems, are essentially very local, and the solutions must be local as well. As with most struggles for power in Somalia, the result is a compromise between the various actors. Prior to their destruction, the UIC had banned the export of charcoal, but had allowed for the sale of existing stocks. However, even this agreement is now up in the air as the TFG struggles to assert itself in Mogadishu and other parts of southern Somalia. In order to attract necessary support from the business community, the TFG will need to find a compromise on the issue of charcoal that allows for the sale of existing stocks, but recognizes the environmental dangers of continuing production of charcoal. This case study describes how external actors have exploited the instability in Somalia to store hazardous waste in the country. This study is similar in the dynamics between local external actors, local business men, and the ill-effects on the environment. This case study examines deforestation in another failed state situation: Haiti. The main culprit for deforestation in this situation, howevere, is agirculture and the timber industry. This case study looks at the civil war and situation of state-collapse in Somalia. This case study examines the relationship between timber exports and their use in funding the Khmer Rouge guerrilla group. The interaction between violent factions and an ecologically harmful industry make this case study similar to mine. This case study analyzes the oil industry in Nigeria’s delta region. This case is similar to mine in its examination of the role that external actors play in obtaining a strategic natural resource in a conflict area, and the effects that can have on the environment. Besteman, Catherine, and Cassanelli, Lee, V., (eds.) 2000. 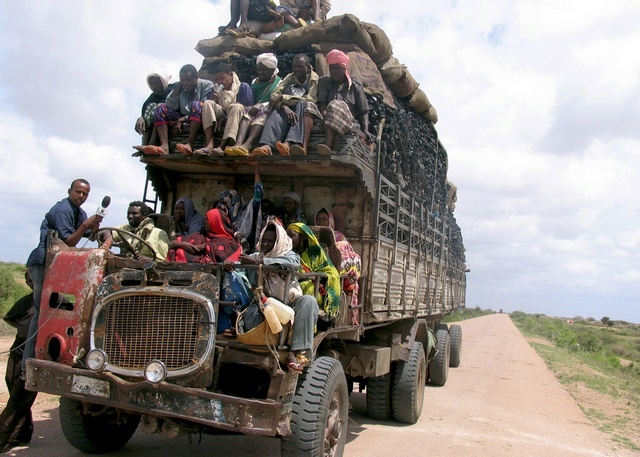 The Struggle for Land in Southern Somalia: The War Behind the War. Haan Associates, London. 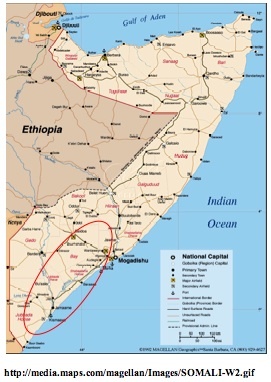 Global Security, “Somalia Civil War,” http://www.globalsecurity.org/military/world/war/somalia.htm. Grosse-Kettler, Sabrian. “External Actors in Stateless Somalia.” Bonn International Center for Conversation. Paper 39, 2004. Hosier, Richard. “The Economics of Deforestation in Eastern Africa.” Economic Geography. 64. No. 2 (1988): 121-136. Little, Peter. Somalia: Economy Without State. Oxford: James Currey, 2003. Reno, William. “Somalia and Survival in the Shadow of the Global Economy.” QEH Working Paper Series. Working Paper no. 100, Feb. 2003.